The Gourmet natural olives Valsamikes, are Kalamata variety olives and constitute one of the prime gourmet and functional olive products of Sakellaropoulos organic farms, due to their combination of taste and health beneficial properties. It is not by chance that the gourmet Kalamata olives Valsamikes are the olives chosen at the University of Athens school of Pharmacognosy for the 1st clinical study at the 401 General Military Hospital in Athens, with volunteers, where the results of the study showed a reduction in cholesterol levels in the majority of volunteers who consumed just 5 of the Valsamikes olives per day. The gourmet Kalamata olives Valsamikes are handpicked exclusively from our organic olive groves, fleshy olives at the optimum maturity stage; they are subjected to rigorous selection by hand and undergo many months of natural fermentation without chemicals and additives, with scientific monitoring throughout the whole procedure. A significant factor in the taste and high quality of the gourmet Kalamata olives Valsamikes is the fact that they are not pasteurized. The production of Valsamikes gourmet olives is carried out with minimal salt throughout the whole fermentation procedure as well as the final packaging, with the addition of organic olive oil and gourmet sweet and sour balsamic vinegar so as to retain the mature as well as the fruity flavor of the olives, while enhancing the creation of gourmet dishes with the emphasis being the unique taste of the Valsamikes olives. 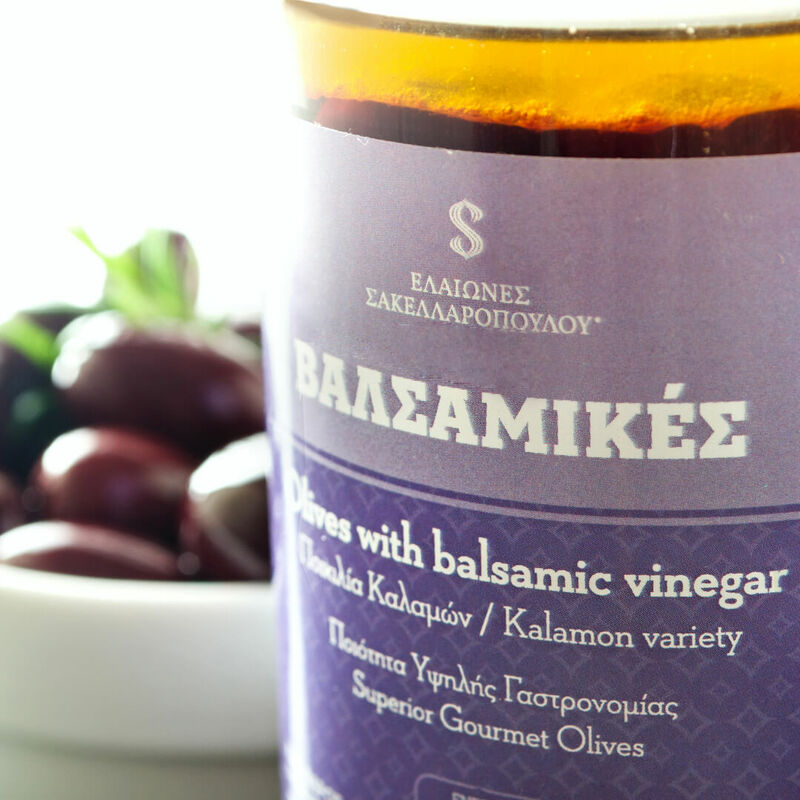 The natural Kalamata olives Valsamikes gourmet retain all the health beneficial qualities that Kalamata olives contain and have been awarded for, with the greatest distinction being the Gold Medal at the Aristoleo High Phenolic Olives Awards 2017 and 2018, due to the high phenolic compounds that the Valsamikes olives contain. Moreover, they have been awarded for their taste and quality at many taste competitions such as the Great Taste Awards in London with a gold star.